The future of wireless is 802.11ax. Asus brings a router with 'Wi-Fi 6' to market, and consider us impressed. Wireless standards come and go, and too often they are more marketing hype than any sort of meaningful, practical improvement (looking at you WiGiG). In an effort to simplify wireless standards, 802.11ac was renamed to 'Wi-Fi 5,' while the latest standard, 802.11ax, is dubbed 'Wi-Fi 6' by the Wi-Fi Alliance. Wi-Fi 6 promises some advantages, including not surprisingly greater bandwidth. The other big news here is Orthogonal Frequency Division Multiple Access (OFDMA), which is designed to increase the number of subchannels for each wireless channel, which should reduce latency and allow the router to handle more clients simultaneously. There are also improvements to MU-MIMO to allow more data to be transmitted at once, and refinements to beamforming as well. 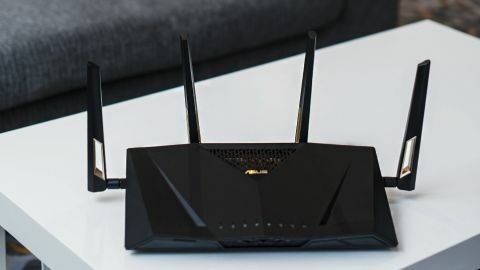 The Asus RT-AX88U, the update to the Asus RT-AC88U, is a newly introduced router that promises to bring the advantages of 802.11ax (aka Wi-Fi 6) to the home router market. This emerging wireless standard certainly holds quite a bit of potential, and perhaps represents an even more substantial step forward than the transition from 802.11n to 802.11ac. However, it comes with the caveat that there aren't currently any 802.11ax client adapters available, so we can't know the router's true potential. As such, we focused on the current tangible benefits of this 802.11ax router rather than what it could be down the road. Still, when upgrading hardware, it can be reasonable to get ahead of the curve and future proof it when possible. The RT-AX88U is a vertically configured router, which allows for the four antennas to be spaced out better than a comparable horizontal unit. The finish is a black matte plastic that has a tendency to show fingerprints. There are also a pair of USB 3.1 ports—one in the back, another on the side. Overall the specs for the RT-AX88U are quite top notch, and easily compete with the best gaming routers out there. The hardware ingredients for this router include a quad core 1.8 GHz CPU, 1 GB of RAM and 256 MB of flash storage. Too many routers neglect their wired Ethernet connections, which are the preferred method for gaming when possible, but this is an area where the RT-AX88U comes through. On the back side is a Gigabit WAN port for the modem connection, along with a healthy eight Gigabit Ethernet ports, enough to connect a whole gaggle of devices without resorting to an external switch. In addition, for even more throughput, two of the Ethernet ports can be configured for link aggregation (802.3ad). Now onto the wireless, which is the real story of an 802.11ax router. Here, the RT-AX88U claims a total throughput of 6000 Mbps, with the 2.4 GHz topping out at 1148 Mbps, and the 5 GHz offering 4804 Mbps. For those keeping score, we have had routers from the previous 802.11ac generation that could get close to that total throughput before, such as the Asus GT-AC5300- but they were tri-band with dual 5 GHz signals. Here, the RT-AX88U offers greater throughput while being only dual band, which is quite impressive—although this is again theoretic due to available client adapters. The RT-AX88U utilizes the AsusWRT interface, the preeminent standard for networking enthusiasts. It has a robust feature set and allows granular control over every setting, including support for VPN client and server, parental controls, port forwarding, personal cloud networking, and guest networking. It is primarily web-based, though it can also be used via an iOS or Android app. The RT-AX88U also boasts a gaming-centric feature set. First, the "Gaming Private Network" WTFast is integrated into the router, and supports a limited list of games. We had mixed results when we previously tested GPNs, but having the service already on the router is still a nice value add that no competitor's routers offer at this time. Another gaming plus is Adaptive QoS, which prioritizes gaming traffic when gaming on a congested network. Finally, another useful feature is Trend Micro's free AiProtection Pro, which is a network level security package. It functions to block viruses and malware, and is included for the life of the router. On the older 2.4 GHz frequency, the RT-AX88U performed in throughput testing at an acceptable (but hardly extraordinary) 152.35 Mbps on our close-distance test, and 158.23 Mbps on the far test. This might appear disappointing, but it's important to realize that 802.11ax offers no real benefit on the 2.4 GHz frequency. Moving on to the 5 GHz frequency and 802.11ax starts to shine. The RT-AX88U on the close test hit 300.62 Mbps of throughput, and 271.43 Mbps at the far distance, which handily outclasses our previous top router, the ASUS ROG Rapture GT-AC5300, which scored 230.6 Mbps and 226.11 Mbps, respectively. The RT-AX88U also showed improvement with network congestion control. When running our 'Network Gaming Traffic Test,' which consists of playing Medal of Honor: Pacific Theater at 720p, while running five simultaneous YouTube Videos at 1080p, the RT-AX88U could give this game the highest FPS to date of any router tested, at 38.9 FPS, beating the previous leader, the Asus ROG at 33.6 FPS. Also impressive is the RT-AX88U had an even lower rate of video packet loss at 6.04 percent, which topped the previous impressive result of the Asus ROG of 7.76 percent. In our testing, the next generation of Wi-Fi, 80211ax (Wi-Fi 6), provides clear benefits to 5 GHz throughput and gaming in a network congested environment. While the current street price of $346 does put the RT-AX88U in the high end category, with performance this good, it deserves to be there. Color us impressed with what we have seen of 802.11ax so far. When it comes time to upgrade your router, the Asus RT-AX88U is more than worthy of consideration.